Bwin – online bookmaker – Review and bonus 100%! Bwin betting office is a publicly tradeable company at Vienna stock exchange. It is considered to be one of the best known providers of online betting. Economical reports can be found on bwin.org. The company has more than 20 million customers from all around the world who can use all products including online poker, casino, games and sport bets. Bwin employs 1400 employees, 800 of them right in Vienna. Incomes of Bwin were unbelieveable 800 million EUR, 200 million of it were sport bets. Bwin is a long-term sponsor of Bayern Munchen, Real Madrid and MotoGP series. Everyone who is 18 and older can craete an account. First of all you have to fill some info on page Sign in now. If you deposit or withdraw more money, you could be asked to prove your identity. Bwin is a betting company for recreational bettors. Odd level is usually 91,5%, which ranks Bwin as an average office. Advanced bettors could also meet betting limits very soon. 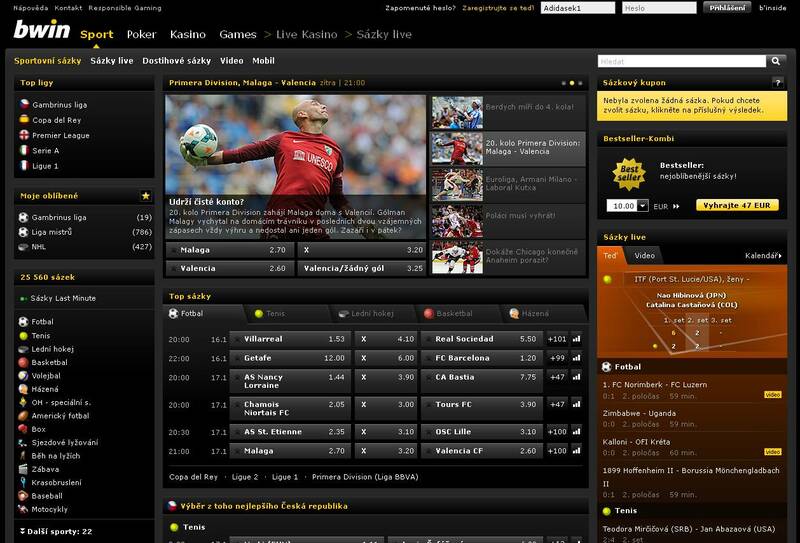 However, if you don´t bet for thousands EUR, Bwin is a great choice for you. You can use wide range of payment methods. Using e-wallets like Moneybookers/Skrill or Neteller and bank transfer is chargeless. Use of credit cards Visa, Visa Electron and MasterCard costs you 2% fee. Withdrawals are free, but you may wait for your money up to 5 days. Communication with support runs through prescribed templates and for real solve of your trouble you always have to go through to a real person. However, if you do it, technical support can solve any problem.